Is that a humming sound? Hum becomes buzz. An insect passes by, unhurried. Buzz fades into hum again – and the insect vanishes. A bird on creaking wings utters a plaintive call as it crosses the glinting river and heads for the horizon. Leaves rustle, clutched in the trunk of a feeding elephant, arriving, unheard, on tiptoe. His tummy will gurgle in a minute. The fruits are good, this time of year. A muffled cough betrays the presence of a lion, somewhere, sheltering from the tropical sun in the shade of a scrubby tree. No jet trails in the sky. To foreign ears it’s quiet, but this humming, rustling, coughing, creaking, plaintively calling continent sings its perennial song, whether they hear it or not. A long, lazy river winds its stately way through a broad valley bordered by distant escarpments. It’s the dry season. 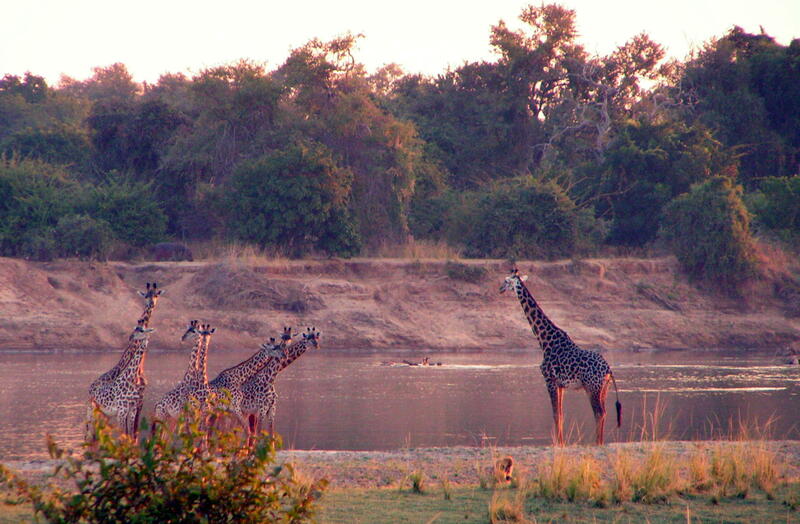 Sandy banks stretch for miles where once a formidable torrent crashed towards the Zambezi. Today the air has a smell that’s dry. A rusty, dusty, tired smell, as the day declines. But here in the southern hemisphere, despite the heat, it’s winter and another scent curls its way over everything. The scent that greets me as I step, weary from the ten-hour flight, onto the old grey tarmac of the airport. The scent that slips through the vents with the seeping orange dust as we drive the Great East Road. The scent that whisks me back here on an instant when I open my conker-brown polished wood pot. It was meant as a present, but I kept it. Africa is in there, if I need her. And so to late afternoon. The shutter drops on daylight and evening steals the night. Above us, only sky. But no, not only sky. The stars. Oh, my, the stars. Shooting to earth, racing to extinction. Glorious for one pinprick in the endless fabric of time. I’m easing myself back in, gradually. All too soon will come the vaccinations and visas, insurance and boarding passes, the petty annoyances of travel that will make me forget why I’m going. And so I ask, does Africa, immense, unfathomable Africa, know a song of me? I’ve never had a farm in Africa, at the foot of any hills. I’ve never seen the sweat on the faces of coffee pickers and I don’t see ploughs, not where I go. But I’ve seen the tall giraffe. I’ve seen the new moon, lying on her back. I’ve seen the air quiver, but not with a colour that I have had on. No children, to the best of my knowledge, have invented a game in which my name appears and my shadow will not be cast on any gravel drive when the moon is full. I have seen the giant eagle owl, in the valley of the Luangwa, but it won’t be looking out for me. No, if she doesn’t know a song of Karen Blixen, Africa surely doesn’t know one of me. Karen Blixen writing under the pen name Isak Dinesen. This entry was posted in If you only read one ..., Zambia and tagged Africa, elephant, giant eagle owl, giraffe, Isaak Dinesen, Karen Blixen, Luangwa, Travel, Zambia. Bookmark the permalink. Yes, Africa beguils, bewitches and seduces. I have a hippo. I oil it every few months. The wood’s cracking though. I think it’s time to go back. Lovely post. Thank you. Thanks Audrey. I like the thought of you oiling a hippo! Yes, I always think of tsetse fly bites when I think of the Africa itch – you think it’s gone then suddenly it needs scratching again. that is really beautiful, makes me want to go !! I wish I could write like you ! Thanks big sis, it’s been along time in the crafting, this wordy stuff, and I’m not there yet! Your song, it’s too much. I hurt, I hurt. I cry. Ah, John,what can I say? I don’t want you to hurt. Do you have the chance to go back to your old home? I started to write this piece because the Karen Blixen words were in my head, as they often are. I saw the film adapted from her book when it came out (Caravaggio or Out of Africa was the choice in London’s Leicester Square that day) with the words spoken (in my opinion – I know there were mixed views) beautifully by Meryl Streep. Despite the incongruous casting of Robert Redford I sank into the film entirely and several times found my face covered with silently cried tears. I was with my mother. She was worried about me, but it was just the beauty, the wildness, the randomness and pain – yes, pain too. Maybe it’s not always a bad thing? Or maybe good can come of it at least. Thank you Mary. It’s your own song, this post, that moved me so. I chose not to see the film, perhaps I should have. There’s another Story of an African Farm, fiction this one, by Olive Schreiner It opens with the sentence: “The full African moon poured down its light from the blue sky into the wide open plain.” Published 1883, my copy, the “New Edition” of 1892, bears on its fly leaf, in elegant handwriting, the inscription “Constance Manning. January 1892”. Ah – what a lovely thought. Thank you. Kat, is it? Thank you, the feeling has been there a while, the words took a while longer, I’m glad it spoke to you. Ah, where is home when you’ve given your heart to a place that’s not home? When I was in Ghana earlier this year the woman who ran the place we stayed said a lot of African Americans come to Ghana to trace their roots thinking they’re ‘really’ Africans and at last they’ll find their spiritual home, only to find out they’re ‘really’ Americans. Roots aren’t always what they seem, are they? Good to hear from you again – yes I’m well thanks but been mad busy – more of that soon! How are you?